REGER Cello Sonatas Nos. 1–4. Caprice in a. Caprice in b, op. 79E/1. Kleine Romanze in D, op. 79E/2. 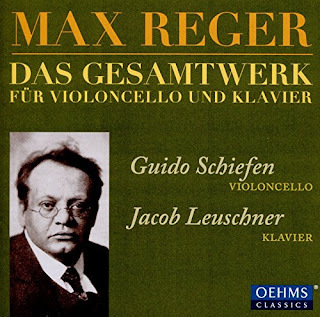 Reger’s cello sonatas are among his most demanding works, both for players and listeners, but they are some of his most rewarding too, especially when heard in performances of this standard. There is little of the neo-Baroque sensibility that characterizes his Solo Cello Suites here; instead we find a high Romantic style, with lyrical cello lines supported by terse and harmonically involved piano textures. Poor performance can make this music hard work, and the sheer complexity of the piano writing often threatens to completely subsume the cello. But not here: Cellist Guido Schiefen and pianist Jacob Leuschner give readings of clarity and textural focus, genuinely engaging from beginning to end. The four sonatas span Reger’s short career, the First dating from 1892, the Fourth from 1910. The stylistic trajectory is from a Brahmsian early phase, through a complex and Modernistic middle period, to a more refined late style. The First Sonata is Reger’s op. 5, but his technique is already highly accomplished, and although this is more straightforward music than the later sonatas, it is still an accomplished work. Echoes of the Brahms sonatas are everywhere apparent, yet Reger is already writing denser textures than anything in Brahms, and already experimenting with the paradoxes that define his later work, the harmonic and textural ideas in the piano focusing on the moment, while long, lyrical cello lines hold the structure together. The First Sonata is in three movements (although its duration is still substantial at around 25 minutes), but the Second establishes the four-movement form that is also common to the last two. In all three cases, the extra movement is a short and fast scherzo, a real workout for both players, although all are relatively short, in the three to four minute range. The Second Sonata, like the First and Third, lands running, with the weighty and highly involved piano textures heard from the very opening. But the Second also has many moments of calm, and the sudden sense of stillness these create is profound, like those brief moments of transcendence in Mahler symphonies that both offset and contextualize the grandeur of the tuttis around them. The Third Sonata is probably the most daunting, in terms of its scale, harmonic and contrapuntal density, and in the technical demands it makes on the players. But again, Schiefen and Leuschner demonstrate that there is nothing to fear, that elegance and clarity are possible – and all this without diluting the sheer musical substance of this monumental work. All that density, or most of it at least, falls away in the Fourth Sonata. This work is as long as the others, and its melodic invention is no less sophisticated, but the textures are generally lighter, a fact emphasized by the solo opening, only a single phrase of unaccompanied music for the cello but a stark contrast to the turbulence that opens the previous three. Guido Schiefen has the ideal tone for this music, plenty of breadth, but also with a tenacious, woody edge that allows him to project through the piano textures. That edge becomes even more prominent in the higher register, giving the often intensely expressive climaxes a sense of tonal focus, yet without ever turning ugly. Schiefen’s bow may have been used in the premiere of the First Sonata (it once belonged to the dedicatee, Oskar Brückner), which is about as tenuous a claim to authenticity as I’ve ever heard. But the bow, or at least the bowing, really elevates this performance, and the way that Schiefen can maintain the long lines, elegantly shaping the phrases and often adding broad swells at climaxes and at phrase endings, produces a performance fully accordant with the grand scale of the music. Accompaniment from Jacob Leuschner is equally accomplished, technically astute and with exceptional clarity of texture, for which the Oehms engineers no doubt deserve equal credit. Many fine recordings of Reger’s music have been released in 2016 to mark the centenary of the composer’s death, but this release is the finest I’ve heard, and is definitely recommended. I’ve previously been partial to a recording of these works by AlexandreKniazev and Édouard Oganessian on Saphir 001103, but this new version is in a different league, both for performance and sound quality. The Alban Gerhardt/Marcus Becker version on Hyperion 67581/2 is much more competitive, and the two versions vie for top position. My main complaint with the Gerhardt, though, is that he intersperses the sonatas with the op. 131 Solo Suites, a jarring juxtaposition that over-emphasises the complexity of the sonatas. This new version does break the sonatas up with a few shorter works, two Caprices and two Romanzes on the first disc and an Aria on the second. All are elegant miniatures, well crafted but probably elevated here by the sheer conviction of the players. The Aria is a curiosity, a shameless pastiche on Air on a G-String. 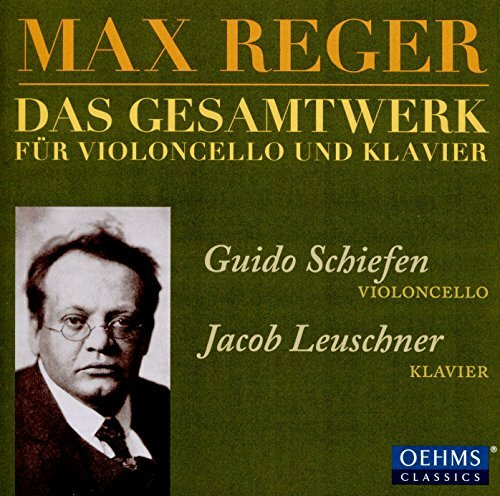 It is more often heard in the original violin and piano version, but including Reger’s own transcription here justifies the album title: Das Gesamtwerk für Violoncello und Klavier. These brief interludes apart, the album isn’t easy listening, but the sonatas are among Reger’s finest accomplishments, and these performances do them full justice. This review appears in Fanfare magazine issue 40:3.